Taichi is a treasure amongst the cultural heritage of the Chinese Martial Arts. Its techniques open a gateway to the ancient philosophy of the Yi-Jing, which describes the mutual relation between Yin and Yang. They offer an insight into Wuwei, the Way of non-doing to reach the Dao, as taught by the great philosophers Laozi and Zhuangzi. Through practicing the form and pushing hands training drills, the focus lies on polishing the skill of suppleness and cultivating the modesty of yielding to the opponent. In this way, health and vitality are strengthened while simultaneously pursuing the martial art skills of “softness overcoming hardness”, “stillness overcoming motion”, “small triumphing over large”, “slow controlling fast”, etc. Master Wu Rong-Huei in the lineage of Yang style Taichi transmitted by Grand Master Song Zhi-Jian will teach Supple Taichi skills, during workshop will take care/handle, in compliance with the essentials from the Taichi Classics, to fix up/plan in detail the basics/fundamentals of physical relaxation, form, pushing hands absorbing/neutralizing, and advanced pushing hand moves/tricks training drills, along with comments on the Classics etc curiculum/program. This includes the ten essentials from Yang Chen Pu : “raising the crown of the head” , “draw in the chest and pull up the back”, “relax the waist and the abdomen”, “settle down on the pelvis”, ”sink the shoulders and drop the elbows”, “dissociate the full and the empty”… From Master Cheng Man Qing “Beautiful lady’s hands”, “not moving the arms”. From Master Song Zhi Jian “original space position”, “original body position”.The training drills of three Masters of the Yang tradition. This statement seems very contradictory, yet all these apparent contradictions stimulate the emergence of life’s deeper potential. It is a philosophy of life and a principle for self-cultivation. It teaches us that whatever our current situation is, it has the potential to change. And it teaches that things may actually be the opposite of what they seem. Similar contradictions are found in Taichi. They describe the natural balancing between Yin and Yang. So, in Taichi, we find the skills of “stillness overcoming motion”, “small triumphing over large”, “softness overcoming hardness”, “four ounces toppling one thousand pounds” and “Yin and Yang mutually sustain each other”. The skill of “Yin and Yang mutually sustain each other” is to emerge naturally; the key is to hide the usage of Yang and to display the effects of Yin, or to hide the usage of Yin and to display the effects of Yang. My Tai Chi team has taught training courses in suburbs of Washington, DC, with three devoted students of Ben Lo. Since 2000, in collaboration with David Chen and Joanne Chang and, after David’s untimely passing, with Charles Votaw, we had many great experiences working with American T’ai Chi players who embraced the teaching of Master Lo. In his class, Ben taught only what he had learned from Cheng Man-Ching. Ben did not add his personal opinion or splashy frivolous techniques. 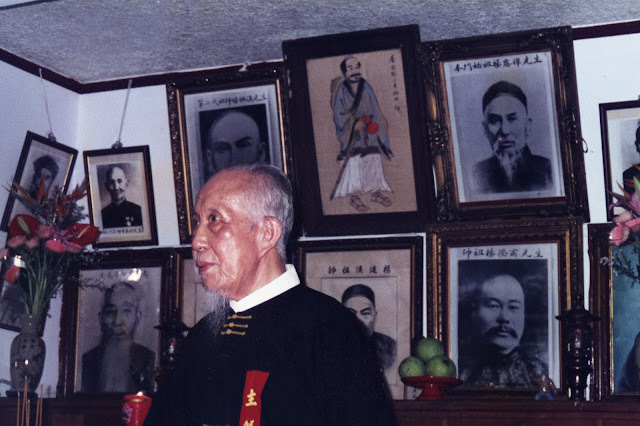 Zhanzhuang (standing like a post) and form correction--the most fundamental of all teaching methods in Tai Chi Chuan--were also among the most favored activities in his class. 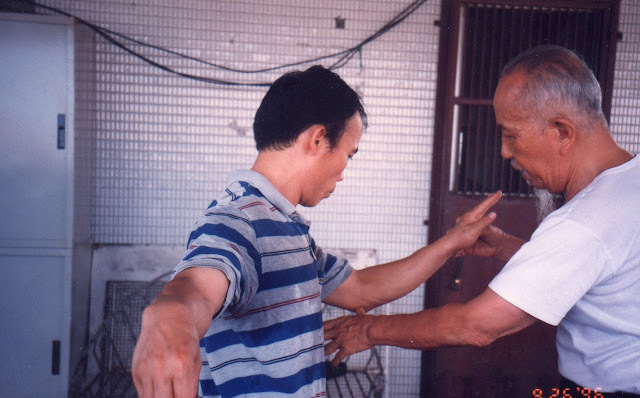 Even going back to 1990, post standing and form correction were all Ben taught in a class that Tang YY, my long-time translator, in North Carolina. 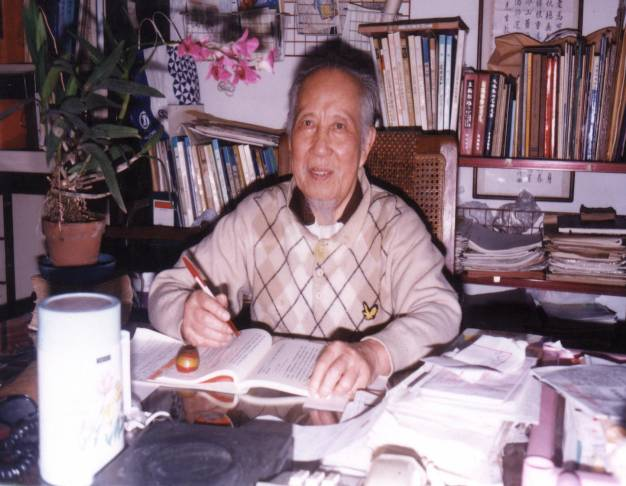 That workshop was organized by Frank Wong, a Cheng Man-Ching student, but it demonstrates that Ben Lo’s teaching style did not waiver over the years. In that class, YY recalls, Ben would, for each posture, correct one student until he was satisfied before he moved around the room and did the same for the next student. All the while, all students were sweating as they stood, body weight on one bent leg. Their weighted legs were burning, no doubt, but they were enjoying the class very much. Over the course of a few hours, and only a few postures, the class would learn the valuable lesson of simply holding the posture until the body could find the correct alignment and relaxation. Ben Lo would correct and position each person, but their body had to remember it. The source of their burning thighs was “bend knee down low”, or “bend low”, which sounds almost just like Ben Lo. “Bend low” is almost a trademark of Ben Lo’s training method. Bending low usually means burning thigh muscles for a practitioner. Burning in the thigh, more specifically the quadriceps, is essential to learning Tai Chi Chuan. Indeed, “no pain, no gain” has been Ben’s core training discipline. In addition to his love for T’ai Chi Chuan, David Chen was an accomplished artists. Building on this concept, he captured Ben Lo’s teaching in this epic painting: a practitioner in post standing, a flame burning on his weighted thigh, underscored by the caption ‘No Burn, No Earn’. In “no burn, no earn”, Ben pointed out clearly the path he took to learn Tai Chi Chuan--a way forward for Tai Chi Chuan practitioners everywhere. Master Ben Lo passed away on October 12, 2018, in San Francisco, California at the age of 92. The Taichi classics read : “Energy comes from the feet, expands through the legs, is controlled by the waist, and is released through the fingers.” To transmit the ground reaction force through the body from the ground up, movement must be self-restrained so as to not use force. This is because if the arms use force, they will hinder efficient transmission of this ground reaction force, and furthermore, the body will not able to unfold its whole-body energy. Therefore Cheng Man Qing said : “Don’t move your arms in Taichi”. According to the Treatise on Essential Points, the meaning of “Don’t move your arms” is that “movement of the arms is initiated by the waist and the legs, change of the stance is initiated by the body”. It means that the body and the arms only move when they are made to move as a reaction to circumstances, but they don’t forcefully make attacking or defensive movements. This is the fundamental training principle for accomplishing the supple martial arts that is Taichi, where “softness overcomes hardness” and “stillness overcomes motion”.